Woody Allen’s estranged son, Ronan Farrow, wrote an essay for The Hollywood Reporter to condemn the light treatment of sexual abuse allegations made by his daughter, Dylan Farrow. The allegations include Allen sexually abusing his daughter a a child, which have followed the director for decades. During the opening ceremonies of the 2016 Cannes Film Festival, French comedian Laurent Lafitte made multiple jokes targeted at Allen and the allegations, comparing him to fugitive director Roman Polanski. The director brushed it off later when asked by reporters how he felt. Saying comedians are going to be comedians and pick on whatever is in the media and wasn’t offended by the joke. Blake Lively, Woody Allen and Kristen Stewart on the Cannes 2016 red carpet. Photo Source: GETTY images. 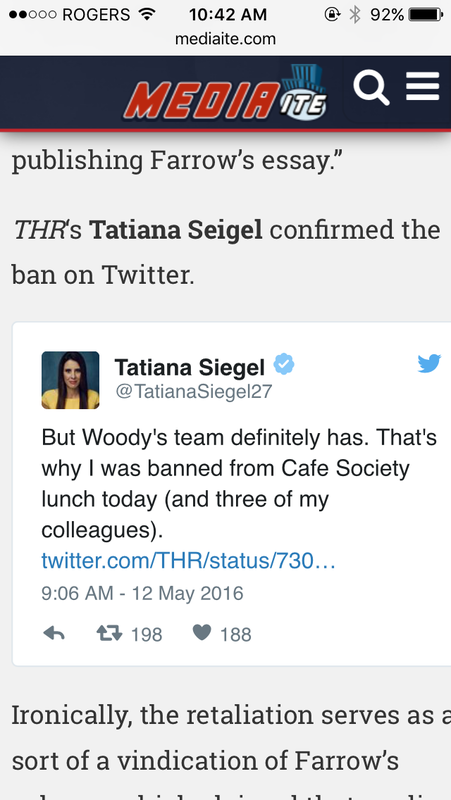 THR’s Tatiana Siegel confirmed the ban on Twitter yesterday. On one hand, the allegations in THR article heavily relied on other publications. But on the other, Allen obviously has proved he has the power to ban a publication from an event, what would be stopping him to use his A-list status to prove his innocence? Previous Post How much does a celebrity owe a fan?